This paper assumes familiarity with the basic Control and Dynamics, as covered in undergraduate courses. 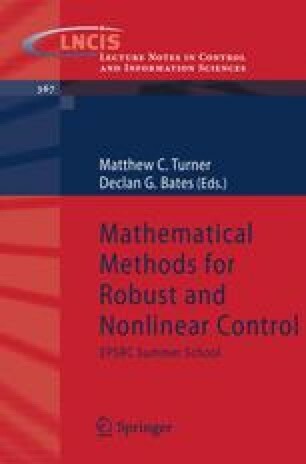 It introduces the different alternative system representations for linear systems and provides a quick review of the fundamental mathematical tools, which are essential for the treatment of the more advanced notions in Linear Systems. The paper focuses on some fundamental concepts underpinning the study of linear systems and dynamics and which play a crucial role in the analysis and design of control systems; thus, the paper deals with notions such as those of Controllability, Observability, Stability, poles and zeros and re lated dynamics and their properties under different compensation schemes. There is a concrete flavour in the current approach which runs through this presentation and this is that of the underlying algebraic structure. The term “structure” refers to aspects of the state space/transfer function description, which remain invariant under a variety of transformations. The set of transformations considered here are of the compensation type and include state feedback and output injection, dynamic compensation, as well as of the representation type transformations that include state, input, and output co-ordinate transformations. This structure stems from the system description and defines the nature of the dynamics and the related geometric proper ties and these in turn define what it is possible to achieve under feedback; such an approach is known as a structural approach. Central to our analysis are the notions of poles and zeros. The poles of a system are crucial characteristics of the internal system dynamics, characterise system free response, stability and general aspects of the performance of a system. The poles of a system are affected by the different compensation schemes and their assignment is the subject of many design methodologies aiming at shaping the internal system dynamics under different compensation schemes. The notion of zeros is more complex, since they express the interaction between internal dynamics and the effort to control and observe the system and they are thus products of overall system design, that apart from process synthesis involves selection of actuation and measurement schemes for the system. The significance of zeros is mainly due to that they remain invariant under a large set of compensation schemes, as well as that they define limits of what can be achieved under compensation. This makes zeros crucial for design, since they are part of those factors characterising the potential of a given system to achieve certain design objectives under compensation. The invariance of zeros implies that their design is an issue that has to be addressed outside the traditional control design; this requires understanding of the zero formation process and involves early design stages mechanisms such as process instrumentation. Poles and zeros are conceptually inverse concepts (resonances, antiresonances) and such mechanisms are highlighted throughout the paper. The role of system structure in characterising different system properties is central to this paper and it is defined by a set of discrete and continuous invariants; these invariants characterise a variety of key system properties and their type/values define the structure of canonical forms and determine somehow the potential of a given system for compensation. Invariants and canonical forms under the general transformation group are linked to compensation theory, whereas those associated with representation transformations play a key role in system identification. The emphasis in this article is to provide an overview of the fundamentals concepts, the back ground mathematical tools, explain their dynamic significance and link them to problems of control and systems design.